I made it to my (45th!!) class reunion. 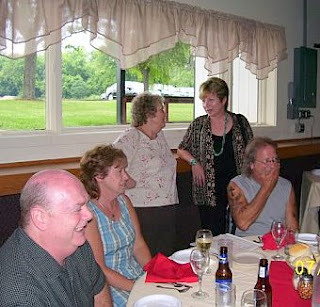 Our class has had reunions most every 5 years. This one had lower attendance, which seems to have stemmed from the higher costs of travel. (We only had one classmate who drove from out of state. ) But all who made it had a great time. Our dinner was at Micelli's in Macedon. This restaurant was orginally known as Turkey Town and was the site of our high school graduation party. 10% of our classmates have married each other. Their ranks were just joined by Rick and Jackie, who were married last weekend after having become reacquainted at our 35th reunion. The highlight of the evening was lots of wonderful music by the Regals. The original Regals group was formed by 4 of our classmates when they were in high school. Mike and Rick and two of their friends entertained us with two terrific sets.